Hearts are heavy as we announce the passing of Mrs. Patricia Evans. Homegoing Services are as follows: Celebration of Life, Saturday April 13, 2019 at 12:00 Southwestern Christian College, Terrell, Texas, Visitation, Friday, April 12, 2019, 11:00 - 3:00 P.M. Sacred Funeral Home, Cedar Hill, Texas, 5:00 - 7:00 P.M. Southwestern Christian College, Terrell, Texas, Wake 7:00 - 9:00 P.M. Southwestern Christian College, Internment, New Oakwood Cemetery, Terrell, Texas. Please keep this family in your continued thoughts and prayers. 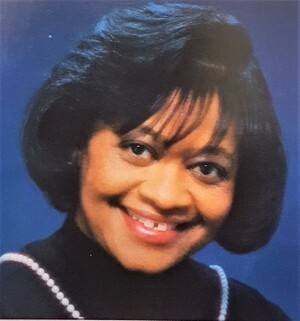 Patricia Officer Evans; faithful servant of God, devoted wife, loving mother, and consummate educator, was received into eternal rest, Sunday, March 31, 2019. The melodious voice of our “Songbird” is now silent, but it will echo within the corridors of our hearts forever. Her life was devoted to God and The Church, her family and to the building and progression of her beloved, Southwestern Christian College. Patricia was born in McMinnville, Tennessee, on November 5, 1941, the daughter of Georgia Florence Brown Officer and Thomas Edward Officer. After graduating from the Nashville Christian Institute in Nashville, Tennessee, she enrolled at Southwestern Christian College in Terrell, Texas, where she completed the Associate of Arts Degree. She then went on to earn the Bachelor of Science degree with a major in English and minor in French in August 1966, from Bishop College in Dallas, Texas. She was employed as an instructor in English and French at Southwestern Christian College in 1966, where she remained on staff until her retirement in 2016. She also earned the Master of Arts degree, from East Texas State University, in 1972. In 1959, she married the love of her life, Jack Evans, Sr. of Houston, Texas and their union was blessed with three sons, Jack, Jr., Herbert, and David. Patricia has led a life devoted to Christ, and used her beautiful, melodious voice in praise to Him and to promote His Kingdom and Southwestern Christian College. Her education and talents were dedicated to teaching in the realm of vocal arts (speech, literature, French and music), but always from a Christian platform. She has guided countless young men and women into developing and maintaining strong Christian lives, through her wise counsel and loving spirit. She has literally given her “ALL” to the brotherhood of Churches of Christ and to Southwestern Christian College. A Cappella chorus. Patricia has thrilled audiences and private listeners locally, nationally, and internationally, and has produced and co-produced several recordings. She is the featured artist on the acclaimed CD, Patricia O. Evans and Friends. Patricia joins in rest, her parents Georgia and Thomas, her in-laws, Grace “Dear” Evans, and Theodore Evans, and her beloved sister Delores “Dotye” Whitaker. Remaining to forever honor and cherish her legacy is her devoted husband of 60 years, Jack Evans, Sr., her adored children; Jack, Jr., (Vicky, wife), Herbert Raye, and David Paul; her grandchildren, Jack III, Brandon, Dajanette, and Damonique, four great grandchildren, two nieces, Patricia Nunley, (Larry, husband) and Teresa Topping, (Gene, husband) and a whole host of extended family and friends, including her church family at the West End Church of Christ. Through her life, God poured out a blessing on us all, allowing us a brief moment to take a sip of the goodness that flowed from this beautiful teacup. Now that she has emptied herself into us, He has called her from labor to reward, to live with Him and the angels, where she can sing praises to Him throughout eternity.